Opinion: Will PC-like upgrade cycles keep iPad sales flat? Tim Cook may well be right that iPad sales didn’t really fall 16 percent year-on-year, and that the number was artificially deflated by reduced retail inventories. It’s also true that it’s been the fastest-growing product line in Apple’s history, and his argument that its success in education will drive future demand also has merit. 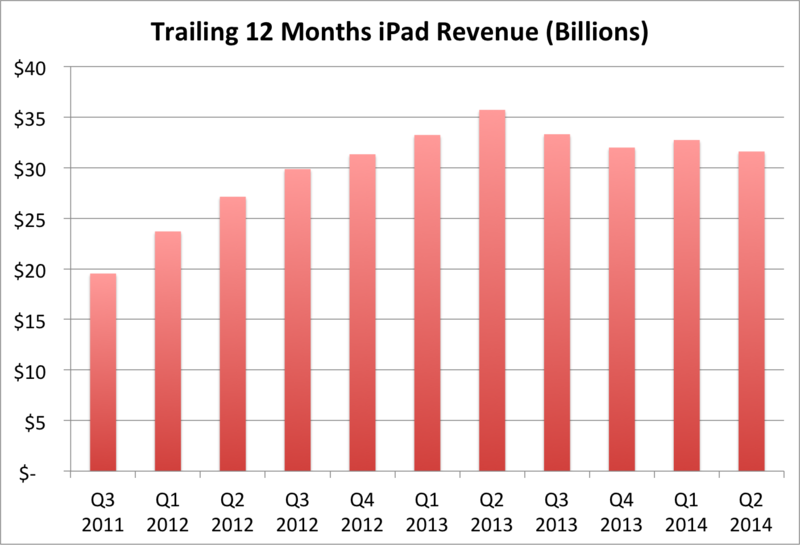 But this chart from Business Insider tells a story that can’t be denied: the overall trend is for flat iPad sales. Contrast with the graphs below: iPhone growing, Mac flat. What this suggests is that consumers are treating the iPad much more like a PC than a phone. Consumers pretty consistently upgrade their handsets every 1-2 years. It’s been suggested that this may change as carriers move away from so-called subsidized contracts, but for the majority the upgrade habit is ingrained – and most alternative contracts are still geared to encouraging that annual or biennial upgrade. Adding to sales generated by that regular upgrade habit is the demand for replacement devices. iPhones are handled multiple times a day, much of it while out and about. As a result, they are frequently damaged, lost and stolen. What is a misfortune for the owner – or their insurance company – is an additional sale for Apple. PCs, in contrast, have a far less predictable upgrade cycle. It’s commonplace for people to use Macs that are five or more years old – and some keep them much longer than that. I frequently see pre-unibody MacBook Pros in coffee shops, and even white MacBooks are not an unusual sight. But Apple pitched the iPad to investors as a growth market, like the iPhone. Not a flat or declining market, like laptops. In the early years of the iPad, Apple had no problem delivering on that promise. As more and more people saw the appeal of the device, sales rocketed. Many of those buyers were, of course, buying the iPad as a replacement for an elderly Windows laptop. Easy to handle, easy to use, instant on/off, no worries about viruses – it was the perfect replacement. But while initial take-up was strong, the upgrade cycle appears to be significantly longer than for the iPhone. There are plenty of people out there still happily using the original iPad, purchased back in 2010, and the iPad 2 remained so popular that Apple kept it on sale until earlier this year. Apple also sees less demand from distress replacement purchases. Unlike phones, many iPads are used primarily or exclusively at home. Those that are taken out of the home are used fewer times a day, all of which means they are far less likely to be lost, stolen or dropped. Let’s be honest here: for many iPhone owners, it’s part useful device and part fashion accessory. While 9to5Mac readers may upgrade for the tech, a significant factor for more mainstream consumers is wanting to be seen using the latest shiny new toy. Laptops, in contrast, are seen more as utility items. They tend to continue to be used until they stop working well. Fewer people upgrade to be seen using the latest, and even if they wanted to, few non-techies could identify the year of a MacBook Air at a glance. Apple’s problem with the iPad may be that consumers look at them as mini laptops, not as phones. If so, upgrades every 3-5 years, rather than every 1-2, may be here to stay. And the pressure on Apple will be not just to create new product categories, but new categories with sustained potential for growth – because the iPad no longer seems to fill that slot.